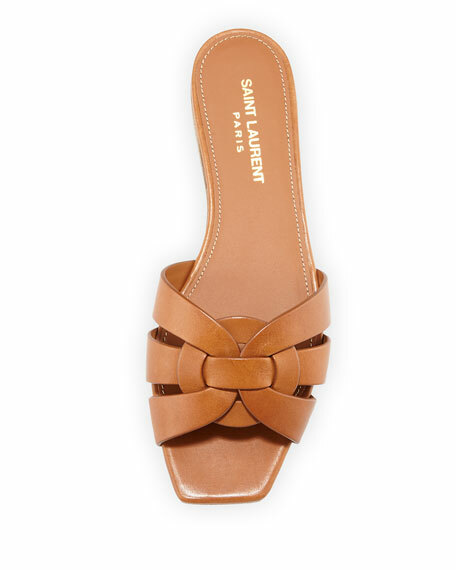 Saint Laurent matte leather sandal. EXCLUSIVELY AT NEIMAN MARCUS Aquazzura suede mule with layered metallic leather feature. 3" covered stiletto heel. Pointed toe. Slide style. EXCLUSIVELY AT NEIMAN MARCUS Aquazzura suede mule with layered metallic leather feature. 3" covered stiletto heel. Pointed toe. Slide style. Leather lining and sole. "Rendez Vous" is made in Italy. Donald J Pliner slide sandal in snake-embossed leather with cork wedge and braided-jute trim. 3.3" heel; 1.5" platform; 1.8" equiv. Donald J Pliner slide sandal in snake-embossed leather with cork wedge and braided-jute trim. 3.3" heel; 1.5" platform; 1.8" equiv. Toe strap. Padded footbed. Manmade outsole. "Janet" is imported. Fendi leather sandal with FF dyed lamb shearling (Spain) logo vamp. Flat heel with slight platform. Open toe. Slide style. Fendi leather sandal with FF dyed lamb shearling (Spain) logo vamp. Flat heel with slight platform. Open toe. Slide style. Molded footbed. Rubber outsole. Made in Italy. Whipstitched leather upper and midsole. 3" cork wedge with 1 1/2" platform; 1 1/2" equivalent. Instep strap and open toe strap shape easy slide style. Leather lining and padded footbed. Rubber outsole provides traction. "Leigh" is made in Brazil.